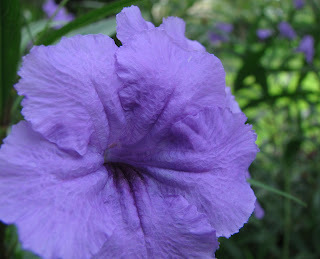 Some people I know (and love) are very fond of purple. So for those of you (I'm surrounded)who fave it... here's a few ways to enjoy it in the garden. Even though it isn't my favorite color, it is one I make use of here and there at Hoe & Shovel. 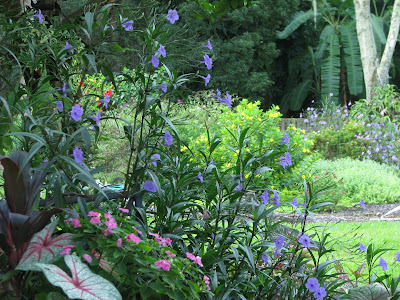 Right now there are purples in the form of foliage and flowers brightening up the garden. The mexican petunia clumps flush out every morning just before the sun fully rises and their happy faces last until the sun goes down. I have a love/hate relationship with the invasive tendencies of this sprawling perennial. Purple queen is another story. Featured (above) here it's billowing over a short hardscape wall and trailing into the flax lily border. No one would argue the value of this hardy, vining perennial as a great performer all year long. 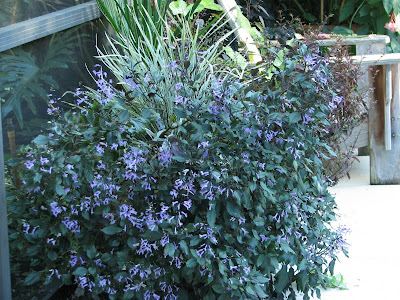 Part of the bargain of purple queen is the teeny-tiny blooms it produces in waves throughout the year. I've snipped off many clippings from this mother plant to start new ones -- in containers mostly-- as it seems to be happier spilling over the side of something. 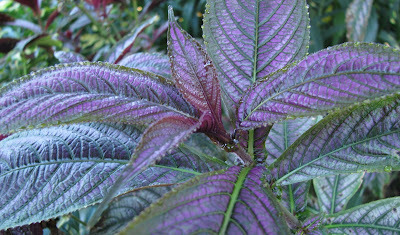 Persian shield is another great performer and known for its striking foliage with deep green veins but rich, purple hues being the dominant eye-catcher. This perennial is hardy all year long as well. It needs to be trimmed back a couple of times during the year to keep it from getting too tall and lanky. While I'm trimming I poke some of the cuttings into the soil to make more plants in other locations. Mona lavender has to be included in our display of purple pretties since it not only flowers its delicate lavender blooms but the underside of its velvety, green leaves are a deep shade of the loveliest, deepest, purple color too. In a recent post I mentioned my plan to yank out all the mona lavender from the pots on the back porch because of the mess they make on the deck. I did transplant every one of them outside in the ground... all but this one (above). It is too profuse to disturb ---laden with branches and blooms cascading to the ground and covering the entire container. 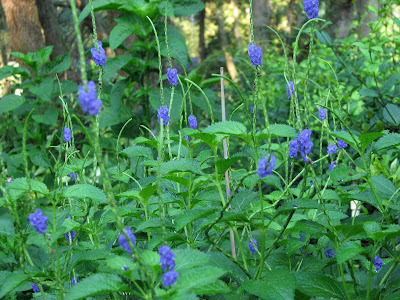 The butterfly attracter blue porterweed has tiny purple flowers that open in the morning and close up in the evening. I seem to favor tall and wispy plants. There are several of these around Hoe and Shovel and I particularly like the way breeze moves through their graceful branches. Blue ginger isn't really blue either. It started blooming this year on August 10 and it is still sparking things up in the front garden. Every morning the bees busily gather around them for their morning supply of nectar. 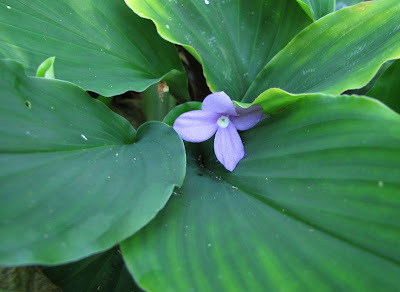 Peacock ginger is a low lying plant with tiny purple flowers. It goes completely dormant in the winter and pops back out in the spring. Truthfully, I'm surprised it is still blooming. As you can see the edges are turning yellow and usually by now the flowers are totally spent. My neighbor got me started on this handy little ground cover that requires absolutely no attention. Mexican bush sage is really putting on a show the past few weeks. The contrast of its long, slender, bluish-green leaves and the velvety texture of its deep lavender blooms adds an element of interest to the garden. Happy to report we broke the 70's ceiling for the first time since June today with temps dropping to 67 degrees this morning and low humidity. It was sooooo beautiful outside all day. I WISH I could have worked in the garden all day. But I had other commitments and only got to do a few things in the garden early this morning. Being in this kind of weather reminds me of how much nicer it is to garden when it cools off like this. All my creative juices start flowing and I want to conquer all the projects I have in my head. Hope you are enjoying your gardening weather too. I'm going out of town for a week... so happy gardening and I'll try to get around to visit you soon. I hear purple is quite the fall color this year. ;) I also find it slightly odd that all the majority of women in your family seem to have a fondness for that exact same color. Great pictures as always. 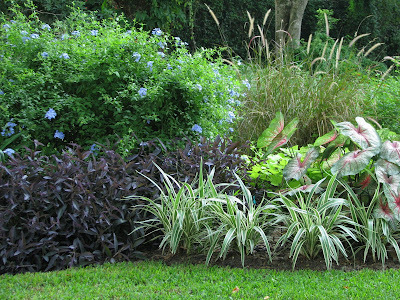 The Persian shield and the blue ginger are my personal favorites. Glad you are enjoying the cooler weather too. I think lots of us in this area have noticed...what a difference a few degrees make! in a beautiful sunset. SOOOOO i can't help but think you had to think of me amoung other in the family when posting this one. your purple varities are so nice. all the way from the towering mexican petunias to the low lying peacock ginger(cool name). i really love the mona lavender and the mexican sage bush. purple queen is great too! especially since you get to put in your containers. have a great week away and try to stay away from blogging too much on your time off. hehe! h.a. my hats off to you & m. for 30. I love the color purple. I also love to see the tropical plants that you can grow, like the ginger. Sophie: Never fear. I always fit some gardening into the schedule but being gone so much does hamper my style of being in the garden for days of endless hours. The fall is always like this but when I get back it will somehow even out. Your profusely growing cupheas would have fit right in for this post. mjm: Now who told you that? Seems every one of them but me ... hmmmm... I've always been the one to buck the system. That persian shield has been a standout for this garden so many different times and in many different locations. I've got several small plants started in pots to be ready for next spring. Just a few degrees and someone sucked out all that moisture and WALLA! it's FLORIDA at its best! marmee: YOU were close to my heart in this posting! And my, how you have changed my opinion on how versatile this color can be with all the unique and tasteful ways you've used it in an interior setting. I adore all the "gingers" so I'm slowly gathering as many varieties as strike my fancy - thanks to my sweet neighbor for her contribution of the blue, peacock & shampoo gingers. 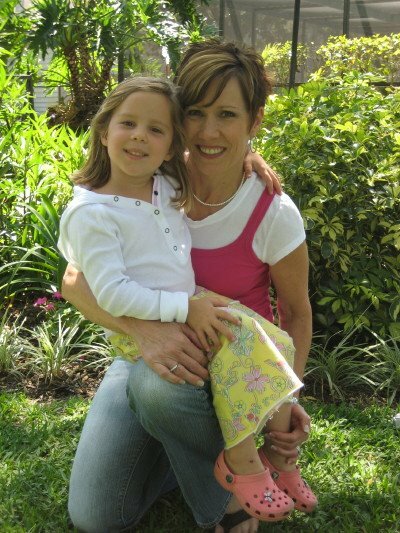 Hi Lisa: The tropicals make me a happy gardener, too. So unique... And when given the right conditions they are easy and mostly maintenance free for all their beauty. I feel your pain about the lavender. For the past two years I've bought lavender in the spring in hopes of it flourishing here. It does well for a while and then I think it doesn't like my humus soil or the rains that come in the summer. Next year I've decided I'm going to create some sandy soil in a pot which will also help it stay drier and see if they will do better in those conditions. You never know but it's always fun to try. Hi Meems, I just love coming to visit and looking at your flowers. Most I can't grow so will never see except in photos, but they are so lovely. The purples and blues seem to be everyone's favorites--mine too. 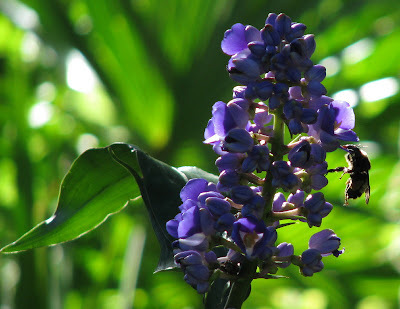 As one of your family whose favorite color is purple, thank you for this walk around your garden featuring the lovely purple blooms and plants. Your garden is like a rainbow of this and that, so you could literally feature a blog on any of those vivid colors. I love it! My pitiful purple spire plant in a container is so not producing like yours. You must have magic soil. I want to try the Mexican petunia and the Persian shield in my sunny yard. I did have a Mexican sage in a sunny corner, but it spread too much for the location and I had to remove it. Anyway, thanks for the beautiful "purple" posting. As always, like a refreshing boost to my eyes and soul. Flowers and plants were given by God to enhance our senses, and your garden is a gift. You and Mr. Meems have a wonderful, relaxed and loving week. Happy 30th! Meems, it is always so nice to come here and visit your lovely gardens. Purples are on of my favorite colors too. The mexican sage is gorgeous and brighter than our russian sage. Will have to see if it will grow in my zone 5b. The Persian shield is an annual here and I have it in a couple of containers-really adds drama. Your container of mona lavendaer is such a beautiful focal point. Have a great trip! I tend to have a lot of pink/blue/purple in my garden, to the detriment of almost every other color. I love the purples you have, and I wish they were perennial for me. No matter, I'll enjoy them in your garden! As my garden winds down, I'm happy to see that a recent addition, an aster (my first) is happily blooming its little purple head off. I really have to try that Mexican bush sage. Your garden is truly lovely. Hi Meems, I just love purples and blues in the garden. Your purple blooms are gorgeous. I love Persian shield. The foliage is so pretty. They arent' hardy here, but I take them inside before the frost and they make pretty indoor plants too. I hope you enjoy your week away! Cameron: Thank you. Purple is an easy color to merge into the garden. Glad to know you like it. Raquel: Thank you. Oh, it was a nice thing that we had some cooler weather. Such a nice break and so delightful to be outdoors. We are enjoying our time away. Marnie: What nice things to say... thank you. I think the cool blues and purples liven up any grouping in the garden which is what makes them so popular with most gardeners. SG aka mom: You are one of the purple people I had in mind when I put together this parade of purple. I remember your mexican sage it was stunning. I bought the one in this post when you and I were at the nursery and you bought your dracaenas and blue pots. Mr. Meems and I are having lots of fun... thanks. 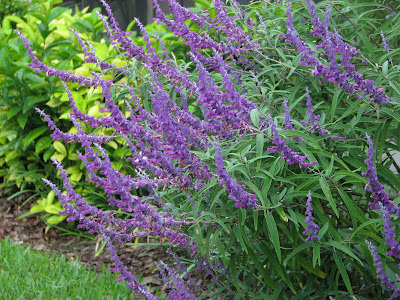 beckie: I found this on Floridata...with regard to the mexican sage.... Hardiness: USDA Zones 8 - 10. Mexican bush sage is sometimes grown as an annual. It needs a long season to grow and doesn't start blooming until very late summer or even into autumn. I've become a big fan of the mona lavender as it has surprised me getting so large and continuously blooming since March. Kim: I've not grown aster yet but see them around on other blogs. I guess there's always room for more pinks, blues and purples... soft and yet vivid... they make our color combinations a lot of fun. brenda blog: Thanks for coming over for a visit. I hope the mexican sage works out for you too. Linda: How interesting you grow persian shield inside. I've not ever been too great at indoor plants. I don't think most plants like the a/c. How do you manage yours to do well? Skeeter: Thanks for visiting Hoe&Shovel. You shaved your cats? hmmmmm? 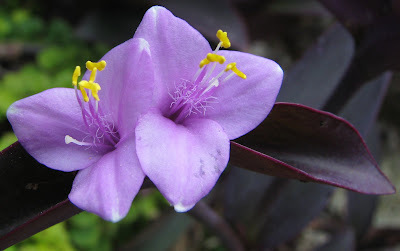 I guess you could call purple queen, purple heart but all our nursery centers tag it purple queen. I love all the shades of purple in your garden. I've never tried growing Mona Lavender but it is really pretty! And I'm also a ginger-nut so I'm partial to those plants as well. I was given a few pieces of Purple Queen many years ago and have made SO many new plants with it. I love it but I always have to wash up after handling it as I have a reaction to the 'juice' in it. Really great and beautiful shots..
GreeenJeans: I've not ever had a problem with being sensitive to the slimy stuff inside the purple queen. Now that you mention it I wonder if that stuff is what keeps it perky even in the hottest, driest weather??? Until recently I kept all the mona lavender in containers. First bought it about a year ago and it has been a great performer. I moved all but the one featured here about a month ago putting them in the ground. It is experimental to see if they will do as well there. They have acclimated well but I'm waiting for them to perk up and bloom again... it remains to be seen how well they do in the long run. Meems, You have such a beautiful place!!! I am unfamiliar with a lot of your purple plants. I was glad you stopped at my place. I was ready to see your fungi slides, but... I can't locate them. What am I doing wrong? Shady Gardener, Thanks, I'm glad you like my purple display. It's so very interesting to me how different our shady gardens are! Unfortunately I don't know how to do a real link so you'll have to cut and paste. Scroll down to the bottom of that post for the slide show. You will notice the photo of the lime-light hydrangea while you're there. Let me know what you think. I am one of those purple lovers! The Persian Shield is a favorite of mine for containers, but I never thought of sticking cuttings directly into the soil--thanks for the tip. The Mexican bush sage's blooms remind me of Russian sage--I love the airy look of this plant. You're probably right about the slimy juice keeping the Purple Queen going in summer. Even in pots, I don't have to water it very often. I like the way it looks in hanging pots. Rose: You aren't the only one who has mentioned russian sage being similar to the mexican sage... I gather the major difference being mexican sage has more of a leafy stem? I appreciate your honesty about making it as a tropical gardener... it does take some tenacity but the rewards are unmatched... at least I think so.Glad you are having some cool Illinois temps... sounds great! Green jeans: I don't think you can go wrong with the mona lavender. As its bloom is spent just snip the ends back and as far as I can tell it is a continuous bloomer. It seems to like filtered sun best. Maybe just try some in a pot to see if you like it... BTW I had a branch break off that I stuck in the ground next to the mother plant and it rooted quite easily that way. I'm growing many of those purples myself. Yours all look lovely, especially in the combos you've created. Yes, we're enjoying milder weather at last too. Yippee! I loved your blog, Meems. I love gardening too, but I don't have a garden here, in NJ as I live in a rented apartment. Out there in Kerala, India we have so many beautiful gardens. Your blog is simply beautiful and some of the pictures brought me nostalgia! I have bookmarked your site just to revisit it later when I need to cheer up! Thanks so much.